Soo I decided it’d be a great idea to dye the majority of my hair blonde in the midst of a heatwave. Its safe to say my hair is drier than the sahara dessert and my skins not doing much better either. I thought I’d share a few of my in shower essentials. First up, the shampoo I’ve been using religiously since dying my hair blonde, is the Pro:Voke Touch Of Silver Brightening Purple Shampoo. Obviously when you bleach your hair, you don’t tend to get that bright, almost white, blonde you’re looking for and thats where purple shampoo comes in handy. This really helps to neutralise brassy tones and keeps it looking blonde, rather than orange/yellow and this does an amazing job at doing just that. Alongside trying to maintain my blonde, in general my hair has been in desperate need of some TLC. Turns out bleaching your hair will dry the f*ck out of it, who knew…(I definitely knew that would happen). Anywaaay, I’ve been reaching for my ever so trusty Lush H’Suan Wen Hua hair moisturiser. Despite the slightly odd fragrance that it has, this stuff works wonders. I like to leave this on as long as possible before washing it out, as it really gives my hair a chance to soak up the moisture. Moving away from the ol’ hair and onto a bit of in shower body care. My skin currently hates me, since I got quite badly sunburnt the other day, which has resulted in a lot of peeling (ew). 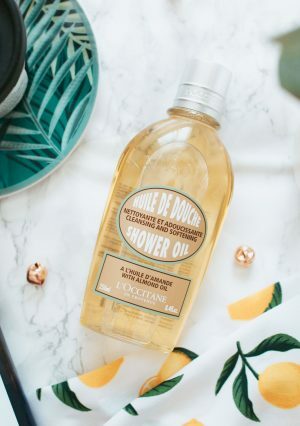 However, for the summer time, I’ve found the L’Occitane Almond Shower Oil* is the perfect body wash. Its super lightweight but still really moisturises my skin, whilst soothing it too. 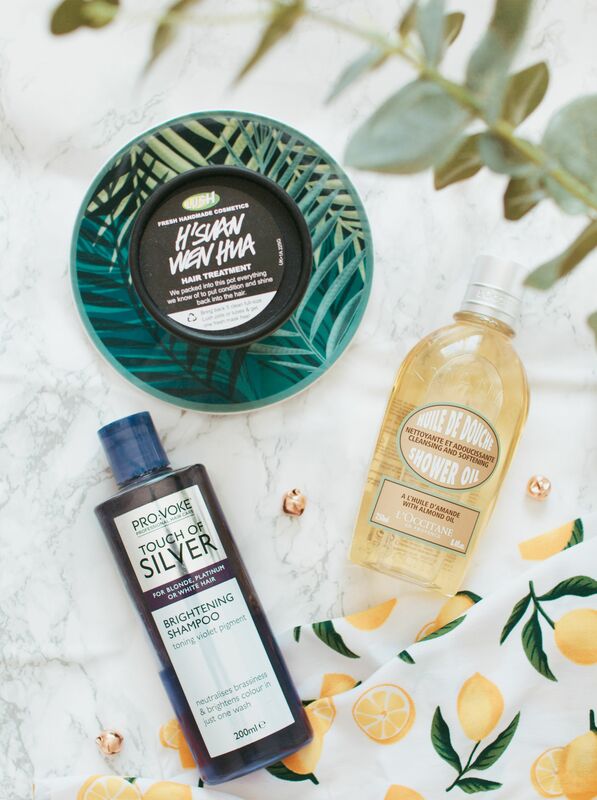 What are your summer in shower essentials?